Previously known as Eduloan, the newly branded Fundi aims to change the South African educational landscape with its new strategy, focused on offering a complete education solution to everyone from first time students to corporates looking for assistance with their bursary fund administration. Since its launch in 1996, the company has assisted almost 900 000 students with education funding to the collective value of R5 billion. Pioneering South Africa’s first fund administration smart card solution, Fundi has also administered over R10 billion in bursary funds so far. “Despite these impressive numbers, I realised when I arrived at Eduloan that there were still many unanswered questions. Where are our past customers? How many are doctors or teachers? How many have passed? Our collection rate was incredible but we never measured the progress that our customers made,” says Amasi Mwela, Fundi CEO. I wanted our business to be one that cares whether you pass or not. We needed to start asking these questions. More needed to be done, and that’s how our vision for 2020 came about. We looked at how we could move Eduloan and turn it into a younger, more relevant brand, and to do this we needed to look at the entire ecosystem. Fundi now is looking at getting/wants to get involved with learners from as early as Grades Eight and Nine, assisting them with their subject choices and exposing them to their interests early on. According to Mwela, Fundi’s aim is to build a solid platform from school on to university, making sure they look at all the key pain points before they even start to look at funding. Edufunding, a platform built by Fundi, offers an easy to use directory of all available bursaries in each field of study. “We first refer students to this platform, and if they don’t qualify then we offer them a loan, mentorship and a range of other support tutoring platforms,” he says. When it comes to the administration and management of funds, Fundi’s technology is behind centralised management and control. “This means we can ensure funds are spent as intended – no matter whether they’re bursaries, corporate social investment or training funds,” he says. The Fundi Card, an easy-to-use, secure solution in the form of a debit card, assists both students and their sponsors in ensuring that funds are spent for the purpose that they were intended. As with any bank card, this solution offers online statements and easy swiping at merchants on and around campus. Bursars can also stipulate how these funds should be disbursed, with sums allocated for rent, food and groceries, books and tuition. “Funds in each pocket can be used only with suppliers that are set up for each category. For example, the books allowance can only be spent at contracted bookshops, and not on food. This ensures that overspending in one category does not affect students’ other commitments. It also teaches them some very important budgeting skills, creates discipline and makes sure the student is accountable,” Mwela says. “We currently manage a R1.5 billion fund with over 200 000 students carrying the Fundi Card, making us by far the single biggest education fund administrator in the country. Aside from just managing the bursary funds, we are also able to facilitate the selection process and provide ongoing support for students. Basically, what we’re saying to corporates is to give us your kids, and we’ll raise them for you.” When it came to the rebranding, Mwela says that a lot of thought and discussion went into choosing the new name.Looking for a name that would resonate with our new essence, it also needed to appeal to our very diverse target audience, including everyone from first-time university students all the way through to corporates looking for a partner to enable their bursary fund administration. We are so much more than just a lending institution. Yes, our core business is education finance, and there is a big need for this so we can’t move away from it, but we are so much more than just a lender. That’s why we have invested a lot of time in a number of value-added products, aimed at the education space. We are the only ones who are positioned to understand this space and its ecosystem, from merchants to corporates and universities. This level of depth in our understanding makes our advice much better than any bank,” he says. Earlier this year Mwela and his team launched the first ever Fundi Concept store. While this store’s main focus for now is to assist students with bursaries or loans, Mwela hopes to see the store grow into a place that caters for everything educational, from books and study aids to tutoring programmes and more. The Polokwane store will have this hands-on experience up and running by the end of the year, with another two stores planned for Bloemfontein and Pretoria. Mwela, an MBA graduate from the Milpark Business School, has a Bachelor of Commerce from Bond University and over 12 years’ experience in the banking, travel services, insurance and educational finance sectors. 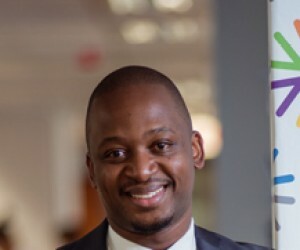 Prior to joining Fundi in 2015 as COO he worked for Old Mutual as acting Head of Operations and before that at American Express Travel Services where he was responsible for client services.